Our recent review about the Andrew James Premium Electric Meat Mincer Grinder and Sausage Maker has been receiving a lot of interest so we thought it was about time that we would provide a quick rundown of the top 6 Mincers/Sausage makers. Each of the Mincers reviewed below have a sausage making accessory which is great for making sausages in your own home. To see our other reviews click here. Not sure where to start when making sausages? Give one of these sausage making starter kits a try! Andrew James Premium Electric Meat Grinder and Sausage Maker is one of the best quality grinders on the market today. 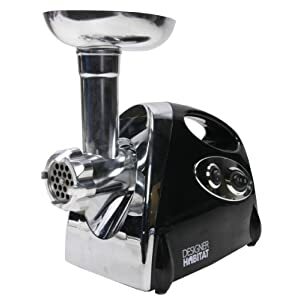 Andrew James Premium Electric Meat Grinder and Sausage Maker has plenty of power as the motor slow down noticeably whilst trying all sorts of things. It is easy to clean. The three Grinding plates are more than adequate for almost anything. The Kenwood MG510 Meat Grinder comes with a premium brushed metal body and is compact in its design. This mincer gives professional results and can mince up to 2 kg of meat per minute. The mincer is east to assemble and cleaning is a breeze. The only downside is the noisy motor and the accessories are not dishwasher proof although they are easy to clean. A wide range of attachments are additionally included: three stainless steel screens for fine, medium and course results, a die-cast metal hopper with meat dish/dust cover and a sausage- and kebbe-maker attachment conveniently stored in the pusher. The Lloytron E5690BK Meat Grinder, 1200 Watt is an adequate machine with a large 1200W motor. This does make it a bit noisey. It can be hard work pushing the meat through the machine, especially when it is set to the fine setting. In summary this is an average machine which is a little slow and it needs a lot of elbow grease to push the meat through, and the sausage machine is not as reliable as the accessory supplied on other machines. The Loytron Meat Grinder has a premium polished metal body, a compact design and an on/off/reverse switch. A wide range of attachments are additionally included: three stainless steel screens for fine, medium and course results, a sausage maker, kebbe maker and a food pusher, and Aluminium food basin. The Breville VTP141 Meat Grinder will quickly become an indispensable tool in your kitchen. The grinder is simple to set up and has suction pads so it should not slide on the worktop. The grinder very well made and would not look out of place in any kitchen. Grinding could not be simpler, just cut the meat into chunks and put it in the machine and away you go, the meat is the transformed into quality mince. The sausage attachment is easy to use and is great fun. The machine is easy to clean and comes with an instruction booklet which also provides you with some excellent starter recipes. As with most mincers this machine large and could be difficult to store. The kit also includes a food pusher to help insert the food into the grinder and a sausage stuffer for perfectly-formed sausages. View the Breville VTP141 Meat Grinder and Sausage Maker at Argos. The Clatronic KM-3414 is an amazing kitchen tool for making food preparation quick and easy. The stainless steel bowl has a 5 litre volume capacity, and up to 2 kg of dough can be mixed. The kit includes a stirring hook, dough hook, and whisk and sausage accessory. After a hard day's work the KM-3421 can be easily cleaned. Although this blog post is generally about grinders we would recommend this machine if you are short on space or only need to mince ocassionally.